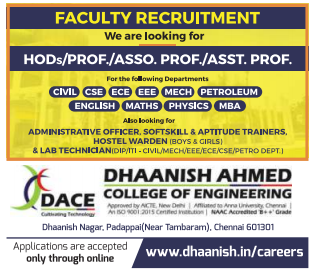 Dhaanish Ahmed College of Engineering, Chennai, Recruitment 2019 Assistant Professor/HOD's/Lab Technicians Jobs,Dhaanish Ahmed College of Engineering Notification 2019 for Assistant Professor/HOD's/Lab Technicians Jobs,Assistant Professor/HOD's/Lab Technicians Jobs in Dhaanish Ahmed College of Engineering. www.dhaanish.in for more information for Dhaanish Ahmed College of Engineering Jobs. Eligible Aspirants can send Updated resume to college address are given below. More details about Dhaanish Ahmed College of Engineering Jobs (2019), including number of vacancies, eligibility criteria, Salary, selection procedure, how to apply and important dates, are maintained below. Assistant Professor/HOD's/Lab Technicians Jobs in Dhaanish Ahmed College of Engineering. Dhaanish Ahmed College of Engineering. Starting date to Apply for Assistant Professor/HOD's/Lab Technicians Jobs: as soon as possible early. Interested Aspirants can send Updated resume to college address are given below .